Going into the Stanley Cup playoffs, Charlie Coyle was not expected to be a top goal scorer for the Bruins. In 21 regular season games after being acquired for Ryan Donato, the Weymouth native only had six points. Three games into the first round, Coyle has been very productive offensively and is tied for the team lead in goals with two. He has arguably been the Bruins best forward in the opening round so far. While the series against Toronto is far from over, the Bruins will need Coyle at his best to advance. When the Bruins, acquired Coyle earlier this season it was not seen as a headline move. Although his offensive statistics do not jump off the board, he has been a solid addition. While Donato is a superior goal scorer Coyle is a better defender and has more size. This makes him better equipped for the physicality of the postseason than a smaller player like Donato. So far his style of play has translated perfectly to the postseason as the former first-round pick has been impressive. Additionally, Coyle found a knack this postseason for scoring timely goals. In Game 1 Coyle was held scoreless, but in Game 2 he got the Bruins on the board first. On Monday, his power-play goal pulled the Bruins within one at the very end of the third period. Although the Bruins ultimately lost, Coyle put them in a good position to tie the game. For the Bruins, this has not been a surprise, as it is exactly why they traded for him at the deadline. 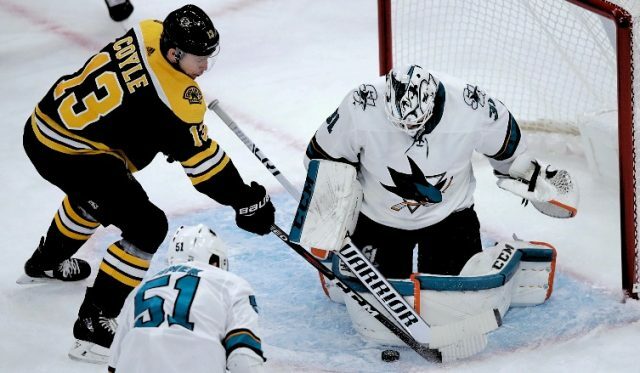 When the Bruins acquired Coyle, they believed he would elevate his game in the playoffs and bring balance to a lineup that depends heavily on its top line. In the playoffs, Coyle has done just that. So far in the series, he has been determined to get pucks to the net and has taken it upon himself to shoot. Coyle’s playmaking ability has made the Bruins third line a threat even though Marcus Johansson has missed time. His strength has been on full display as at times he has held off three defenders while protecting the puck. Coyle has used his strength to his advantage and been rewarded on the stat sheet. As the Bruins look to advance to the second round, they will need contributions from everyone. In Coyle, they have found a dependable piece that has become dangerous in the postseason. If he can continue his recent play that it could be a special playoff run for the Weymouth native.